This is a really easy thing to make for a party, quick dinner or have unexpected guests. This can be served hot or cold. Directions: in a mixer put basil and pine nuts and mix, then add the parmesan cheese and garlic clove. While it’s spinning stream in the olive oil. You will have a lot of pesto and can divide up into little containers that you can freeze for later use. Different uses for Pesto: On little toast for a quick hors d’oeuvres- add a sliced cherry tomato and a few pine nuts, it can be added on grilled chicken, fish or steak… it just adds a bit of flavor… you can even toss a spoon in soup. The ideas go on and on-even a dollop on a caprese salad adds color and taste! 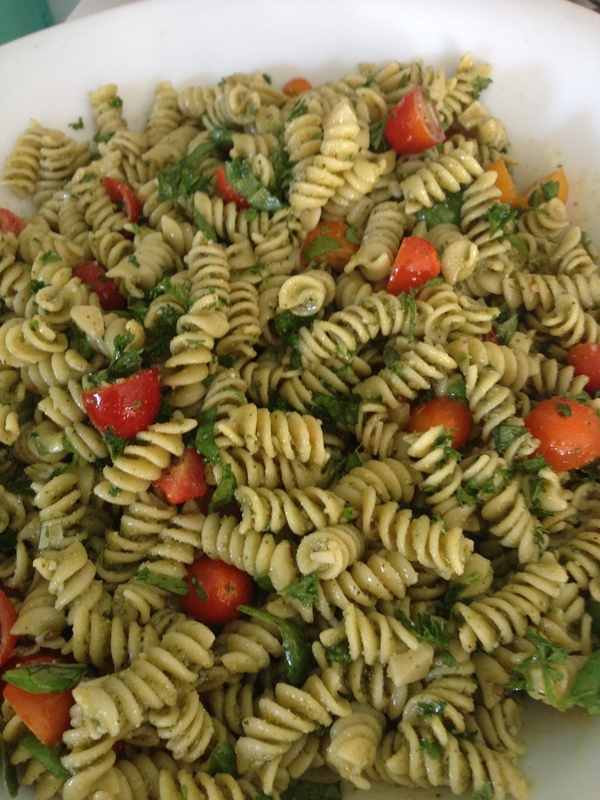 I am using it as a simple pasta salad.